This job is a complete garden makeover. After consulting with our clients and finding out exactly what they wanted for their garden, we set about creating a design that would enable them to achieve their ideal outdoor space. They required specific areas within the garden, they wanted decked areas for entertaining and relaxing and they wanted a play area for children (obviously complying with health and safety requirements). The design was agreed, there was to be a large decked patio of 12m x 4m and a 3.2m curved deck with a pergola. The curved pergola deck was to be located quite close to the play area to allow for easy adult supervision. This play area was to include a playhouse, a slide and a climbing wall, all this equipment would be made bespoke to ensure it was the right size and just as our clients requested. With safety being paramount the entire play area would be laid with the appropriate safety mats. These areas would then be linked via pathways, lawns, flower beds and steps. The first job was to strip out the old garden. We kept some of the soil to create the different levels of the new garden; we also suggested to our clients that we could re-use some of their old slabs from the old patio to create the two paths we were going to lay. The slabs were still in very good condition and perfectly usable, this would help reduce the cost a little, these slabs are often sold as reclaimed and can be quite costly. We also suggested we could probably re-plant some of the existing plants as it would be such a shame to simply replace these well liked and well established plants with new if we could possibly transplant them. (Although there are no guarantees that they would survive but it was certainly worth a try). Despite retaining some soil, slabs and plants it still took 10 skips to clear the garden! 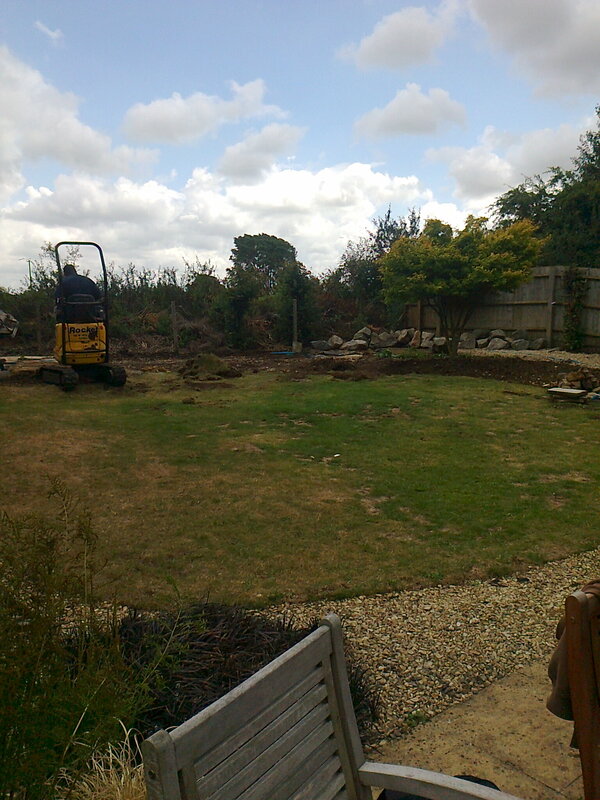 Once the garden had been successfully cleared, we were able to start marking out and creating the different areas and levels for the new garden. The next job was to lay the large 12m x 4m deck. We laid the framework ensuring it was all level and noting where the drains were located so we could leave access to them by means of a trap door in the decking. The laying of the deck boards was the next step and should have been relatively straightforward, but then the heavens decided to open up....(as you can see from the pics above and below). We pushed on and was able to complete this area. The next area to tackle was to be the curved deck with pergola, in the corner of the garden. We set out some of the log rolls to define the area and help retain the soil as this was to be a raised deck with a couple of steps. The posts were cemented into place and the framework laid, before the deckboards and pergola were added to complete.We are going to add some willow screening to the back fence and also the back of the pergola deck. This will give a sense of privacy without making the area feel closed in. This will be connected to the play area with a path (using some of the old patio slabs) there will also be a flower bed. Once again the log rolls of varying heights were used to define the areas and create more interest. We are ready to construct the steps leading to the play area, and we will lay another path from the main decking area to these steps. With the main layout sorted we can now start constructing some of the main features of the play area and the bespoke equipment, this is where things really start to take shape. The playhouse can now be built I'm sure the children will have hours of fun in here. With the Slide in place we can now build the steps, add the climbing wall and lay the entire area with the safety mats, that are recommended for play areas like this and conform to the health and safety requirements. With the construction complete this leaves about 160m2 of garden to be turfed. This area can be shared and used for play or a relaxing area to sit and catch some sun. The whole area needs to be levelled and raked before laying with good quality hard wearing turf. With the turfing complete and some of the plants re-planted, the garden is looking amazing. Even the weather was very kind to us, the rain held off while we were laying the turfs; and then as if on demand just as we had finished we had a downpour which was just what we needed to give everything a good watering in. The garden is now complete other than our clients deciding if they would like any new plants added to the borders. We think you will agree this garden looks wonderful offering something for everyone. Both adults and children will be able to enjoy the space, this is a real family garden. Our customers are very happy with the end result and so are we. This project took four people two weeks to complete. There was a lot of work involved and the weather was quite testing at times; but once again we brought this project in both on time and in budget.